Canadian home prices grew by over 130% since 2001, outpacing income growth over the same period by over 80%. In other words, Fitch says that home prices in Canada are overvalued by 21%. In my words - Canada has a housing bubble. Fitch expects nominal home prices to fall by no more than 10% over the next five years. In real terms (adjusted for inflation), real estate is overvalued by 21% in Ontario, by 15% in Alberta and 26% in BC and Quebec. Even if real estate falls by 10% in nominal terms, investors would take much larger losses in real terms. Additionally, the press release by Fitch states: "The Canadian government has been very proactive with numerous policies specifically targeting a soft landing, which augurs for nominal home prices simply flattening out or seeing relatively small reductions". In my view Fitch is overly optimistic as the government's interventions have not tamed the housing market. Reading the report further I found this quote: "Though prices have continued to rise, despite intervention, the rate of growth has declined. Fitch believes that the likelihood of the soft landing scenario has increased as a result of the government participation." I actually agree with that quote -though I still think that the chance of a soft landing in Canada is slim! Below are selected quotes and graphs from the report released by Fitch. 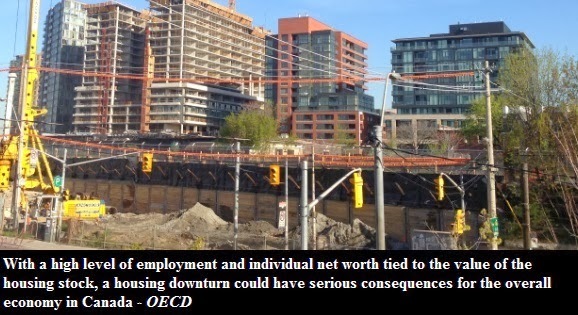 "high levels of price growth have also generated record levels of home and condo construction, and it would be a stretch to define this boom as the result of restricted supply. Certainly, renovation of the housing stock has generated higher - value properties that may skew prices upward, but growth rates are not restricted to new construction or within tight city limit boundaries. Simply put, home price growth has been broad-based and rapid, and faster than that of fundamental drivers of prices"
"Since 2000, the percentage of Canadian GDP in the construction sector has increased nearly 40%, to 7.1% from 5.2%"
"Relative to the 1990s, current price levels in Canada are comparable to those in the U.S. at their peak in 2006." Conceptually it is a housing bubble? "when prices grow at a rate faster than this basket of variables (income growth, economic cycles) would suggest, such a scenario can reflect a growing housing bubble, where the supply and demand economics of the system have been altered by external factors, allowing for a decoupling from fundamentals and an excessive growth rate. In these scenarios, price growth is no longer driven by increasing value in the housing stock but, instead, is primarily a response to the expectation of future price increases." Prices in Alberta are forecasted to decline further even though prices have already dropped somewhat. Compare the housing bubble in the late '80s to what is currently happening (with regards to observed prices). Prices in BC are overvalued by the most. No surprises here. P.S. In other news, OECD released its economic outlook report which includes new overvaluations indicators. I will write on that shortly.